However, I have been using another, less talked about feature on the PC Suite, which I consider the star of the pack. 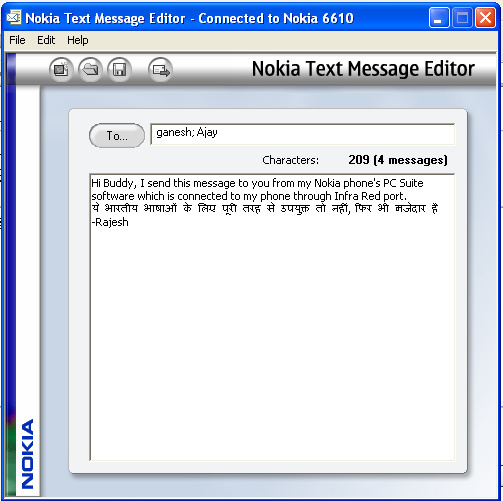 It allows you to type your messages on the PC/laptop screen as you would type anything else, and then send it out to the phone network by transferring it to your phone on one click. Not only that, it will also pick up the phone numbers so you do not have to specify the destination number, only type the name as you have them on your phone, and it would suggest the number by reading from your phone. Want to send to multiple friends, well, this software would give you the same flexibility as an email does, just separate the names by semi-colons. 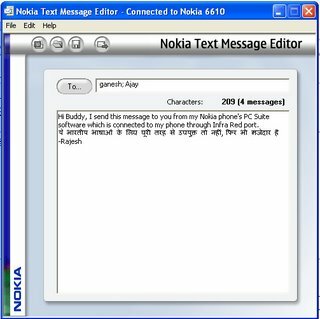 I have sent very lengthy SMS messages using this feature, and the software takes care of breaking them into multiple messages. In case you would be interested, it also allows you to read your inbound SMS messages from the comfort of your monitors as well as reply to them, as if you are replying to an email. Want to delete your messages logged in Sent Items as well as Inbox, well, do a multiple select and delete on the screen, it will go from the phone within a few seconds. I have been using PC Suite's different versions as they have become available, and it is extremely robust now. The download is about 25 MB and not all versions work for all phones so do check out the Nokia website for compatibility. One size does not fit all. One major observation though. Call it a deficiency or even a bug. If you store your phone numbers on the SIM card or any other external card installed on the phone, well, the contacts list is not read properly by the PC Suite, in which case you no choice but to type your friend's numbers every time you would want to use this option. Another caution, if you are reaching out for the CD that Nokia gave you when you bought the phone, well I'd rather advise that you go and download the lates version from their website. But trust me, if you are guy who send out several dozen messages everyday, or sends lengthy messages, this is the solution you were looking for.